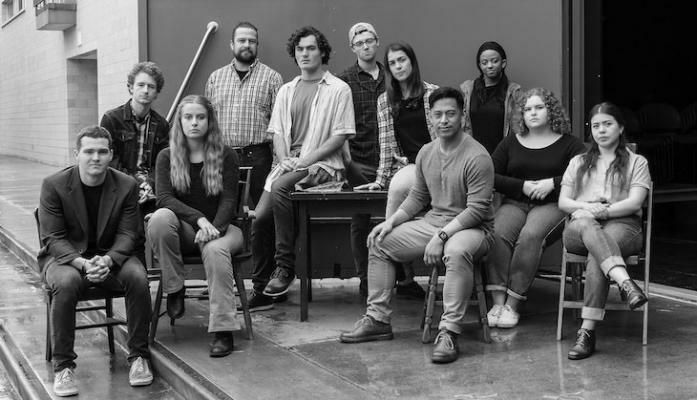 The Laramie Project was originally created by Moises Kaufman and the Members of Tectonic Theater Project as a reaction to a tragedy that occurred in Laramie, Wyoming in October 1998. The play is made up of parts of hundreds of interviews that had been conducted over several trips to Laramie by the Members of Tectonic Theater Project in New York. The Laramie Project production at University of California, Santa Barbara was directed by Eric Jorgenson. Laramie, Wyoming was a town where the train used to stop in the olden days that had a jolly stop as its only label; that is until a hate crime caused the whole world to tune in to its small city. In October of 1998, Matthew Shepard, a young college student of 21, was murdered, found beaten and tied to a fence on the rural outskirts of town. He had been left there overnight with only almost freezing temperatures, the Wyoming wind, and the night sky to keep him company. Matthew Shepard was an openly gay man in a city where the motto was, “Live and let live,” essentially a policy similar to “don’t ask, don’t tell”. This play is what comes after this event and the reactions from many individuals involved or how they were affected by what was going on. These individuals range from Matthew Shepard’s father’s testimony to the medical updates given by the hospital CEO, the accused and friends of either Matthew or the accused. The play runs 2 hours and 40 minutes with two intermissions, roughly an hour and two hours into the production. The main topics of the play include religion, homophobia, and hate. These topics are familiar in today’s society with hate-speech and crimes still very relevant and prevailing in our society. The production was unlike any other play I had seen, with a cast of about 10, each playing numerous characters, and most of the scenes were one person speaking a monologue snip-it from the interview said directly to the audience, rather than acted out to each other. There were props more than a complete set, mostly using chairs and a few tables to set the scene. Costumes were important as well since they identified which character each actor was playing. The light and sound, although subtle, definitely set the tone for the interview that was taking place. There comes a point in the play, that is so incredibly gut-wrenching that most, if not the whole audience become teary-eyed. I heard a man sitting behind me sob and try to contain himself. Jorgenson admitted the event of Matthew Shepard’s hate crime felt personal as he and Matthew lived similar lives, although they did not know one another. They lived not too far from one another, both were 21 and gay men. Shortly after Jorgenson decided to come out to his friends, the hate crime to Matthew Shepard happened. As the 20th anniversary Matthew Shepard’s hate crime just passed, Jorgenson felt this was a good opportunity to bring his story out to remind us and to honor him. The Laramie Project's last showings are March 8th at 8 pm and March 9th at 2 pm in the Hatlen Theater. To get your ticket go to theaterdance.ucsb.edu. The play includes many mature scenes and graphic details, viewer discretion is advised. The Matthew Shepard Foundation was created in his honor with a mission to encourage respect for human dignity and differences by raising awareness, opening dialogues, and promoting positive change. The Laramie Project and The Laramie Project: Ten Years Later play a part in keeping his story alive and thank you in seeing the production. To support, see their work, and donate, visit MatthewShepard.org and follow them on Facebook and Twitter @MatthewShepardFDN. This is an important and timely play although Matthew died so long ago, and unforgettable. This same type of harassment and murder of a gay man happened in other small towns in the US, including Greeley, Colorado (transgender woman, 2008 Angie Zapata), and Cedar City Utah (1988 Gordon Church). Hopefully Matthew's story will help us all to think and act on hate and discrimination which continues unabated.